The big show in the sky of Saint-Dizier this weekend: the air base 113 hosts an exceptional air show, with nearly 40,000 spectators expected. The next weekend, July 1st and 2nd, at Airbase 113 is preparing a great show with prestigious guests. In the programs of the aerobatics demonstrations with the Patrouille de France, but also the presentation of the flagship of the French air force and the air base 113: the Rafale. Marty, pilot of the Rafale, will show the public the full extent of the talents of this combat aircraft. Fly away with the Rafale, and show what it is capable of. That's Marty's job. This pilot is the official presenter of the Rafale. At every corner of the world, in all the aeronautical shows where he flies, Marty has about ten minutes to convince. We are working to maintain our nuclear deterrence by 2040. 23 years in advance and certain here believe that it is through lack of foresight that we have no HMS. Not lack of foresight, but lack of budget, since you had to fund the AESA. With the costs you saved for a medicore F3R upgrade, my hopes are high for the F4 though. Just that it won't benefit Rafale for exports anymore, which is sad. with due respect,plz don't turn this thread into an ego feud thread between both of you as this is an info thread. I hope you guys understand. The Indian Air Force’s original wish to deploy fighters with three BrahMos supersonic stand-off cruise missiles is now an official, timeframed project for the Indo-Russian partnership. Livefistcan confirm that BrahMos, which kickstarted an effort in 2012 to spin off a BrahMos variant that weighed half as much as the original and dimensional smaller, has formally committed to putting the new missile into test mode by 2021, with the specific aim of giving the IAF a three-missile loadout option. The effort to shrink the BrahMos, first revealed here on Livefist in 2012, also aims to extend the capability to the IAF’s upgraded MiG-29s, incoming Rafale jets and Indian Navy’s MiG-29Ks, none of which can currently deploy a BrahMos-A. The smaller BrahMos is likely to be designated the BrahMos NG (the BrahMos-2 is the in-development hypersonic version of the missile). Dassault has decided to call on Altran and Luciad to prepare the pilots for Rafale and Mirage 2000. They will provide the OPERA preparation system, allowing "simulation of a training and a mission", announced Altran on June 22 . The simulation proposed by this system is based on numerous data which allow pilots to better prepare their missions. The OPERA thus provides aerial and satellite catches and detailed maps depicted in 2D and 3D. The system also makes it possible to include the "position of the allied and enemy troops," says Altran. To ensure that the operational strategy is the right one, the OPERA "allows to pre-play the mission". The elements are then "converted into a specific format to be loaded into mission computers". According to Altran, this simulator is easy to use and offers a "functional and intuitive user interface". The OPERA had already been presented at the 2015 edition of the Paris Air Show. Luciad then announced that, thanks to this system, pilots could prepare their missions in less than an hour. ............(. )In the air, France, via Dassault and its Rafale, also hopes to take advantage of Belgium's call for tenders in March to replace 3.6 billion euros with its current US F16 , Acquired in the 1970s in association with the Netherlands, Norway and Denmark. These three countries have already opted for F35 to replace their F16, which suggests that Belgium should follow. "Things are not done at all and the options are quite open," said Florence Parly on Thursday. PARIS (Thessaloniki) - Thales and India's Industrial and Defense Electronics Group Reliance announced on Wednesday the creation of an Indian company to integrate and maintain radars and sensors within the framework of Of the Indian command of the Rafale combat aircraft. The company will be 49% owned by Thales and 51% by Reliance, the two groups said in a joint statement. The financial terms of the transaction are not disclosed. P.S And what about bhel and samtel huh??? IN PARTICULAR TO THE NEEDS OF AERONAUTICS. TO DISTANCE THE THREAT OF THE AIRCRAFT. target in several infrared bands. Which is adapted to the needs expressed. 35 kg with a military load of 10 km. And who has been removed from service. Target is expected to be in 2018. At Paris Air Show 2017, French company Lacroix, specializing in self-protection pyrotechnic systems and training devices for airborne, land and naval applications, is showcasing a wealth of innovations . Lacroix stand at Paris Air Show 2017 featuring a giant LIR111 cartridge as its centerpiece! On the product front, international business is driven by present forecasts for orders or delivery of the Rafale (France, Egypt, India, Qatar…) and Airbus A400M (Indonesia, Malaysia, Europe, …). Exceptional decoy flares for the last generation aircraft. Lacroix has a legitimate position in these international contracts thanks to its new versions of decoy flares, including specific series for the A400M, 120 A400M and LIR 121 A400M and, of course for the Rafale (LIR 410 and LIR 411V1). • NATO 2”x1” combat-proven decoy flares for fighter jets (F16, FA18, etc.) and transport aircraft, operated around the world by numerous countries. • Specific calibers to fighter jets – 40mm/50mm/60mm – from the Mirage 2000 to the Rafale or the Sukhoi 30. Lacroix's R&D department stays ahead of the evolving requirements for countermeasures to protect combat aircraft. • Pyro-mechanisms have both military and space applications. For example, did you know that our R&D teams at LACROIX design special components to take part in highly innovative projects such as the Micro-Carb and One Web satellites and the Ariane 6 launcher with players such as Pacific Scientific and the CNES. Last but not least, Lacroix launched a new website for for the 52nd edition of the Paris Air Show. Check it out at this link. The Elysium announced on Thursday that France and Germany had decided to develop a "European" combat aircraft, intended to replace their respective fleets. Airbus and Dassault have refrained from commenting on what is currently only at the stage of the declaration of intent by Paris and Berlin. The European landscape is dominated by two competing models of combat aircraft, which were commissioned in the 2000s: the Rafale of Dassault Aviation (in image), an exclusively French project, and the Airbus Eurofighter, developed jointly between Germany, Spain, the United Kingdom and Italy. By launching on Thursday, July 13, the project of a joint combat aircraft, Paris and Berlin print their political brand on the Europe of defense, but do not immediately question the rivalry between the French Rafale Dassault and the Eurofighter Transnational Airbus . The Elysium announced on Thursday that France and Germany had decided to develop a "European" combat aircraft, intended to replace their respective fleets. The announcement, made at the end of a Franco-German Council of Ministers, marks a break with the current situation, in which Paris and Berlin each followed their path in this matter, although the two capitals already collaborate in d Other areas of defense such as intelligence drones. 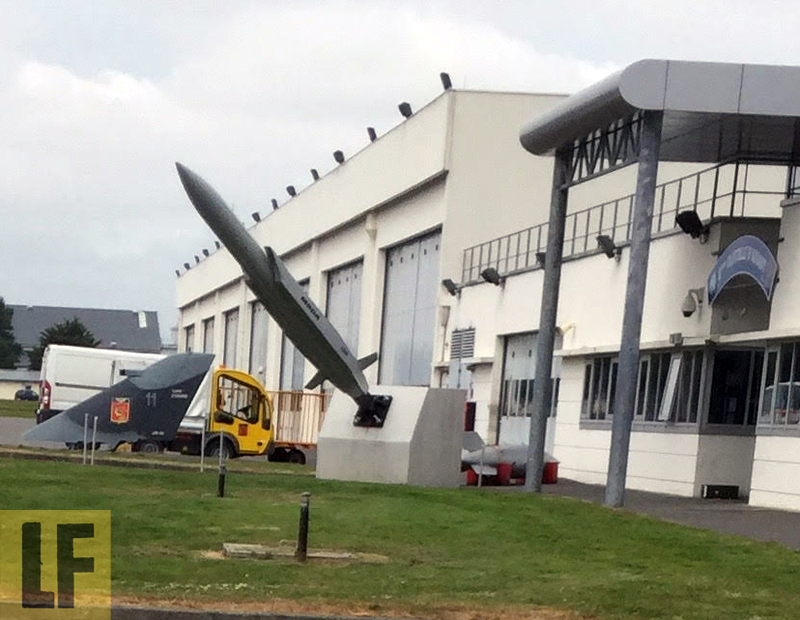 "France and Germany have cooperated very little in aeronautics: France was on the Rafale solo and Germany on the Eurofighter," recalls Massi Begous, an aeronautics specialist at Roland Berger. In fact, the European landscape is dominated by two competing models of combat aircraft, which were put into service in the 2000s: the Rafale of Dassault Aviation, an exclusively French project, and the Airbus Eurofighter, developed jointly by Germany, Spain, the United Kingdom and Italy. Contacted by AFP, Airbus and Dassault refrained from commenting in the immediate moment what is for now only at the stage of the declaration of intent by Paris and Berlin. But within the sector, some actors do not hide their satisfaction, considering it logical that the transnational level becomes the rule for future European fighting aircraft. However, "it is not clear what we are talking about: are we talking about replacing the Eurofighter and the Rafale? ", Which would be a very long term, Mr Begous asked. Germany is faced with more pressing considerations as it seeks to replace its aging fleet of Tornado, an aircraft in service since the 1980s. In March, Airbus said it was working on the subject and already warned that the project could only be successful "in the framework of a close European collaboration", under the rule of France and Germany. But it is not clear that this is what German Chancellor Angela Merkel and French President Emmanuel Macron have in mind.The head of state on Thursday referred to a "profound revolution" by simply drawing out the main lines, the Elysee saying that a roadmap would be established by mid-2018. For Stéphane Albernhe, president of the specialized firm Archery Strategy Consulting, the issues are clear: "they do not touch on current projects". In other words, this announced cooperation will hardly change the situation in the immediate future, as the timetable is written rather in decades. "The Eurofighter is a commissioning in 2004, the lifespan is 40 or 50 years ... We are on strategy very long cycle," said Albernhe. "It will most certainly be an unmanned combat aircraft." While waiting to unravel the consequences for the aeronautics sector, it is above all on the political plane that this announcement, by which Paris and Berlin place themselves in the front line in the often vague concept of European defense. "Bilateral agreements between two, three, four countries, it works, it already existed ... But here, it is to say + France and Germany, we are going to be the locomotive +", judge Mr. Albernhe . "What is implied between the lines is + Europe of defense will progress if the Franco-German binomial is strong," he concluded, considering it illusory to envisage projects of this type involving Of all EU countries. The symbolic stake is all the more important because the shadow of the American F-35 of Lockheed Martin, which is making its arrival in certain European armies, notably Italy. "The question was whether it was necessary to turn to the US manufacturers and France and Germany have just prevented this from happening," said Christian Mölling, a defense expert at the Marshall Foundation. "They were the only ones who could do it." India is about to sign a contract to equip its Dassault Rafales with Rafael's Litening targeting pod, according to Yuval Miller, head of the Israeli company's air and C4I systems division. Miller says the advanced sensors will be manufactured by a local company that is jointly owned by Rafael and an Indian partner. "The Rafale is a multi-role aircraft, and the Litening gives it the flexibility to deal with ground and air targets with the same efficiency," he notes. India will acquire systems including in a Litening 4I standard, which Rafael says enables host aircraft to fly intelligence, surveillance, target acquisition and reconnaissance missions. New Delhi's initial Rafale acquisition is for 36 of the French-built aircraft, but Dassault is already eyeing follow-on sales opportunities with the Indian air force and navy. When Indian Air Force chief Birender Singh Dhanoa takes off for France today and straps into an Armée de l’Air Rafale later this week, it’ll be shortly after he receives the most detailed operational briefing France has ever given to a foreign military chief. With videos, photographs and operational data, the Indian Air Chief Marshal will be provided the most comprehensive view of the Rafale in anger, chiefly the strike missions it has undertaken since last year over Iraq and Syria against Da’esh/ISIL targets. 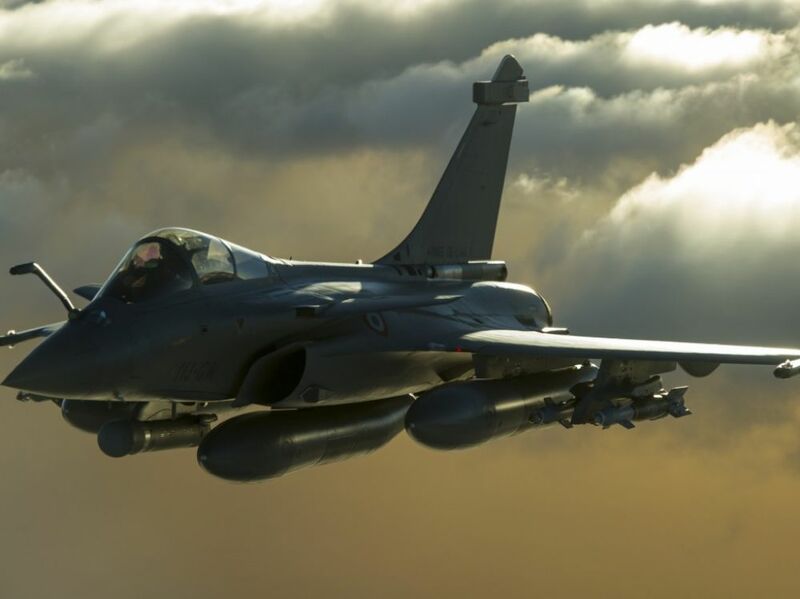 India signed on for 36 Rafale fighters (the Indian Rafale detailed here) in September last year, over a year after the start of Opération Chammal, the French military’s participation under U.S.-led Operation Inherent Resolve. Ever since, the military wing at the Indian Embassy in Paris has been provided periodic official updates on the Rafale at war, information seen as imperative to the aircraft’s most important foreign customer. 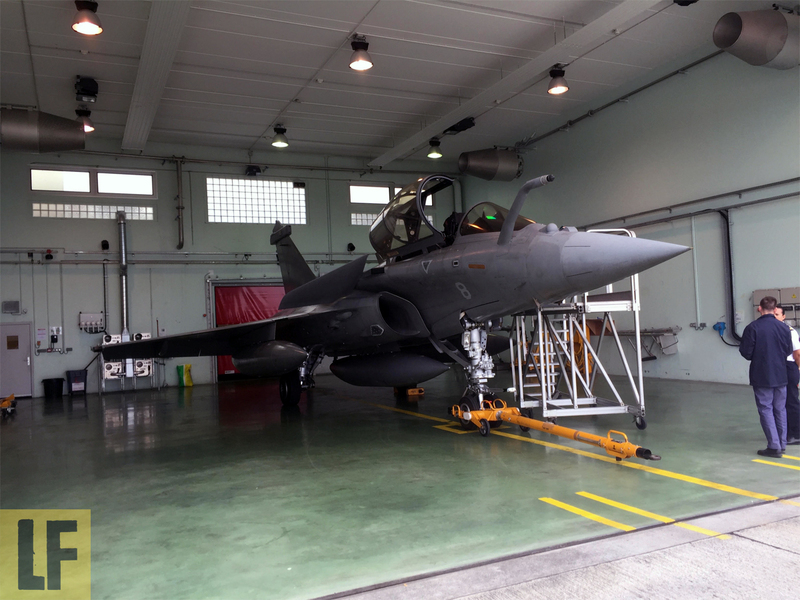 A customer, it must be noted, that chose the Rafale after what is widely regarded as the most grueling field evaluation, but has remained inquisitive about the aircraft in a true combat scenario. 1.“Before Libya, the Rafale-M was on teenage missions. Libya was our first adult mission,” Landivisiau base Commanding Officer Capt. Pascal Lassan tells Livefist, referring to the eight years (2002-2010) that Rafales were deployed over Afghanistan, their first combat mission. No Rafale pilot disagrees. Cassan, who flew one of the Rafales that entered airspace over Libya in March 2011 designates Opération Harmattan a true ‘gamechanger’ for the aircraft and its pilots. Flying combat air patrol missions against Gaddafi’s desperate fighter jets, Cassan admits the Rafales got their first true trial by fire in Libya, stretching out their new laser pods, Link 16 and rules of engagement that had to be updated literally on the fly. It was over Libya, Cassan says, that the Rafale first got a chance to demonstrate its ‘omnirole’ tagline. ‘Libya would shape everything that the Rafale would do going forward,’ he says. Your correspondent, incidentally, was on the ground in Libya during a bombing run by Libyan fighters just days before the Rafales arrived on March 19, 2011. 2.A Commander-rank Rafale M pilot who has flown missions both during Opération Harmattan in Libya as well as the ongoing Opération Chammal against Da’esh targets in Iraq and Syria, says mission endurance and potency have multiplied manifold since 2011. For instance, while missions over Libya were no more than 2.5 hours, combat sorties over Iraq and Syria currently average 6.5 hours with three mid air tank-ups. Rafales currently have a 600 nautical miles unrefuelled range from the aircraft carrier. Crews maintaining the jets on the carrier told Livefist that the two squadrons at sea enjoy a 97% availability rate (as opposed to 70% rate on shore). Livefist was shown video footage of a coordinated strike earlier this year in Ramadi, Iraq involving a U.S. MQ-9 Reaper that had expended its armament load, but needed to effect a strike because intelligence had pointed to a closing time window on a vehicle-borne improvised explosive device (VBIED). The Rafale pilot who was called in to help explained the loop: the Reaper was cleared to engage the target, but couldn’t because it had finished its Hellfires on the same mission a few hours earlier. The Rafale, flying a close air support mission nearby was summoned to link up with the Reaper and receive its target solution. The course of this target sharing includes France’s own independent vetting of targets under the Chammal chain of command. Once cleared, the video shows the Rafale deploying an AASM Hammer guided bomb to destroy the VBIED. Nearly every pilot that Livefist spoke to made it clear that the TALIOS new generation targeting pod couldn’t possibly come sooner to replace the near obsolete DAMOCLES pod. “The Damocles is manages to stay useful, but only barely. As part of the coalition, pilots have access to laser designation and target painting resources by partners in the air — it could be a Super Hornet or a Predator,” one pilot says. 4.Capt. Cassan, who says he has flown F/A-18s for three years and deems it a ‘versatile multi-mission jet’, says that when it comes to long range sensors, the Rafale still manages to see ‘much better than what the Americans can see’. He’s referring to the Thales RBE 2 AESA radar on the Rafale. ‘Every pilot that’s now flying over Iraq or Syria will tell you that they’ve got or are getting more than they’ve expected in terms of sensors and tracking systems. The Meteor missile is just going to take all of that together and multiply it manifold. We cannot wait to see it deployed,’ says one of the pilots. 5.‘We drop more GBU-12s than any other weapon at present,’ confirms the Commander-rank pilot quoted before. Over Mosul, the pilot says, Rafale crews have effectively deployed Sagem AASM Hammer bombs (SBU-54/38/64), which have reportedly proven highly reliable against moving targets. The AASM kitted CBEMS 250 is also expected to see greater usage, the pilots indicated. “I dropped an SBU-38 recently about 90 feet from a mosque in Mosul. There was clean visual confirmation of a VBIED under preparation. It was a precision attack with no apparent collateral damage,” he says. The BLU-126/B of the US Navy is currently the major low collateral damage bomb in use, with France waiting for its own — trials currently on. Pilots say they’re waiting for GBU-24s to be cleared for Rafale carrier operations. The SCALP stand-off cruise missile has also seen heightened use under Operation Chammal. A pilot who launched SCALP weapons on two occasions in 2015 in Iraq and Syria says it is, not surprisingly, the most prized weapon currently in the Rafale’s strike arsenal. ‘The opportunity to send out a SCALP always means a mission to destroy a heavy duty target in an environment that could pose an air defence threat. While our young pilots are ever ready to get into dirty airspace to open up with bomb raids, each is waiting for a chance to let a SCALP loose,” he says. 6.“We’ve been tracking the Russians as a matter of routine, including the Kuznetsov battle group and submarines too,” one pilot says. He wouldn’t confirm if the Russian submarines tracked by French Rafale-Atlantique crews include the new generation Russian Krasnodar diesel electric submarine, which deployed Kalibr cruise missiles against Da’esh targets in May this year. “We’ve got to keep a daily tab of what Russian and Syrian aircraft are doing. The E-2Cs from Charles de Gaulle have a full time job, and we’re constantly hooked up,” he says. 7.In 2016, with Russian jets from the Kuznetsov over western Syria, Rafale crews operating in the area were tasked with entering airspace to acquire something they didn’t have: the attack mode of a Russian Su-33 radar. Two Rafales used their SPECTRA integrated electronic warfare systems on a 90 minute mission that finally ended in success. “It was a small but very important mission, and it helped sharpen how we use electronic warfare and signature acquisition in some of the most difficult and crowded airspace in the world,” a pilot who was in one of the Rafales says. 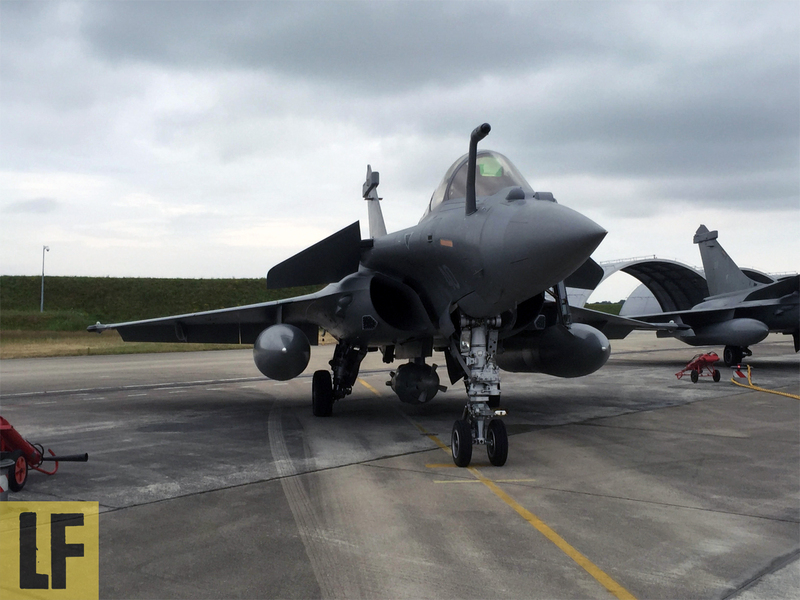 9.Air strikes in Mosul have proven more difficult than any other part of Iraq, Rafale pilots at Landivisiau confirm. One pilot, who flew missions there earlier this year, says the challenge went beyond the fact that strikes needed to be precision attacks in built-up areas. “It was very hard to target in Mosul. We were operating in crowded airspace. It wasn’t clean at all,” he says. Adding to the cluttered airspace were veritable swarms of drones deployed both by Da’esh as well as Iraqi forces — quadcopters sometimes armed with grenades. “The game-changer will be low collateral damage bombs that currently in trials for use in Iraq and Syria. Another mission like Mosul will be difficult without those,” the pilot says.